Deja Vu Dresses, or one of the downsides of mesh templates. Déjà vu, (/ˌdeɪʒɑː ˈvuː/) from French, literally "already seen", is the phenomenon of having the strong sensation that an event or experience currently being experienced has been experienced in the past, whether it has actually happened or not. This one is the Suede draped dress from Cynful. While the textures are different it's obvious they're from the same sourced template. These two are not the only versions of this template I've seen, it's everywhere. It's a nice dress, but not everyone needs to be making their own version of it. Let me be blunt. 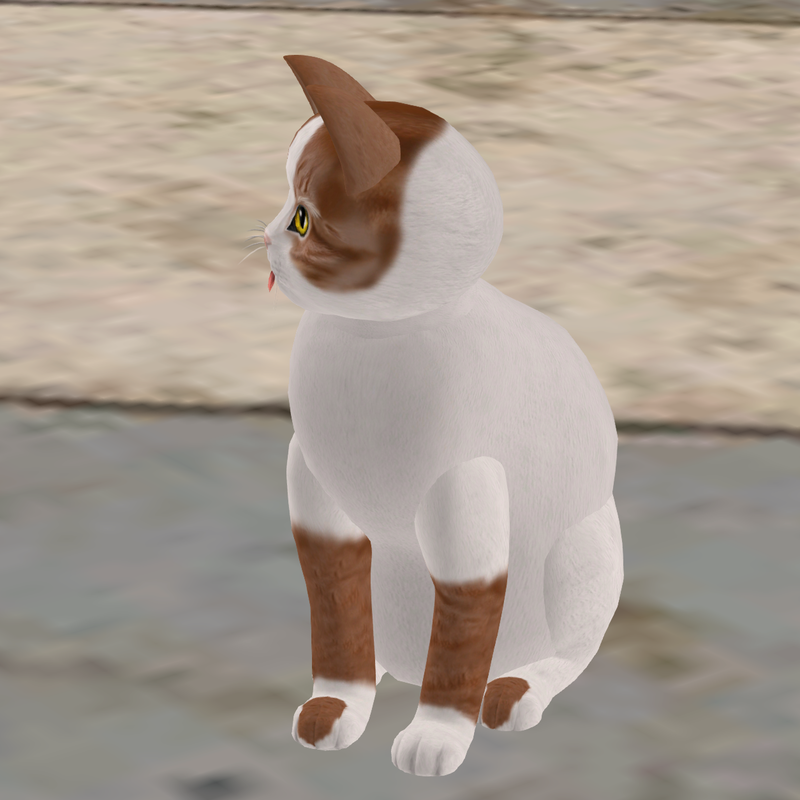 Designers, if you don't do your own mesh, try to use templates that aren't being used by every "Art School Girl" with competent photoshop texture skills out there. Becuase otherwise, we get dozens of variants of the same dress to sort through. Not only that, even though there's a glut of this "slap some nice textures on templates" stuff, it doesn't seem to keep some designers from charging premium prices. If there's a dozen versions of a template dress..you might not want to charge something like L$500 for a single color, perhaps not even L$300. The Cynful version is L$265 for each individual color. There's nothing inherently wrong with using templates....the problem is when the same ones are used by a large amount of people, then we get a glut of sameness and lookalikes. Sometimes it seems like I know a lot of the neo-burlesque crowd in SL...especially the redheads. Yes I know, but I can't help it. These are the cheescake pictures I took at my new house. Yes, I do have a house besides the Linden Home I use for my studio. No, you're not going to find out where it is, that would be telling, unless you are one of my close personal friends. And no, it's not at my parcel in Caledon, that's a park. I decided to see if I could get a good shot through the window as if some paparazzi caught me posing inside. Not great, but not bad either. Just relaxing on my "Gustavian" Dutchie bed... yes, its the "Sapphic" version if you get my meaning, not that I'm planning on getting any use out of it other than pictures and it looking pretty. While Dutchie furniture is reasonably priced and attractive...by my standards...the bed was a bit "dear. As far as I could tell this is the only Dutchie bed that comes in a "Sapphic" version. Which is a little bit bad, I actually liked the brass bed slightly better. Oh well, beggars can't be choosers and at least there was a "Sapphic" option available, that was a nice thing. Ever since cute blonde Gogo changed her blog header I had been thinking that I needed to do one rather than just have plain text. I had been meaning to do it, just never got around to it. I am, after all, quite a lazy blogger. I liked it so much, because it "exemplifies Ms. CC" , so I quickly cropped it down to make a new profile picture. However, my friend Mr. Whybrow of Caledon said it was dark and could use some lightening up. I had taken it using a non-fixed region windlight because the lighting was good only a few minutes before....it had gotten darker, and this pic looked even darker in the profile. He suggested I try again with prim lighting... but I don't do that, don't usually need to because I'm running around with a fixed time windlight....but not this time. But I liked the picture so I normalized it up in the GIMP and used THAT. Then I realized that might make a good blog header. Played around with it until I realized it would work best with some text on it, so I added some BodoniXT in The GIMP. That got my header. So Kudos to Gogo and Mr. Whybrow...and my new EVGA GT640 Rev 2. (that's the recent Superclocked GDDR5 version not the 2012 version) video card, which let me actually MOVE (with a low 15fps) with ambient occlusion, full shadows and depth of field on. And not crash a few minutes after turning them off again. In fact I've turned them on and off 3 times. I think everyone in SL knows about KittyCatS by now. 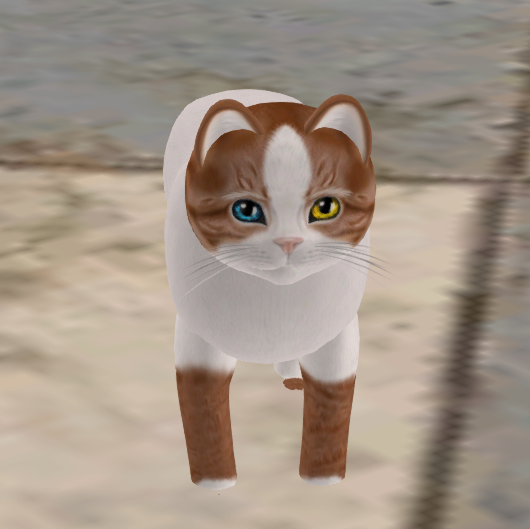 KittyCatS are a breedable scripted pet created by the team of Dennis Lagan, Equinox Pinion and Callie Cline. Yes, THE Callie Cline. Yeah yeah I finally caved in and got one....only just birthed it now after my SL move. She...is adorable. I don't plan on breeding her, so I'll perma-pet her eventually. Yes, I took cat pictures. I do it in RL too with my RL cat. Caught her with her tongue out.